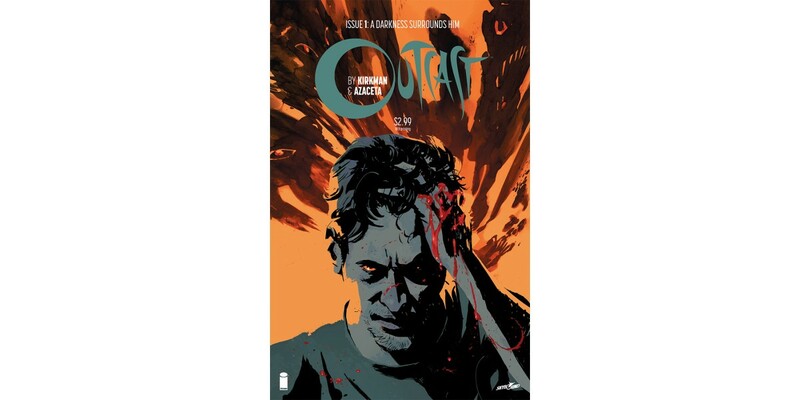 The first issue of Robert Kirkman and Paul Azaceta’s breakthrough bestselling series, OUTCAST BY KIRKMAN & AZACETA, has sold out again and Skybound/Image Comics has fast-tracked it for a 5th and final printing. The new series has achieved THE WALKING DEAD-level success—garnering comics industry praise alongside mainstream attention early on—and has a pilot television episode underway with Cinemax. The hot new horror series follows the afflicted life of Kyle Barnes, a man with a tragic past and a horrifying gift. Demonic possession and a creeping, unnerving sense of dread permeate the series, and critics have likened it to classics like The Exorcist. OUTCAST BY KIRKMAN & AZACETA #1 boasts a special double-sized first issue for just $2.99. Demand for the series skyrocketed upon its initial release and has grown exponentially with the announcement of the forthcoming television series. OUTCAST BY KIRKMAN & AZACETA #1 remains available for purchase across all digital platforms, including the Image Comics website (imagecomics.com), the official Image Comics iOS app, Comixology’s website (comixology.com), iOS, Android, and Google Play. This 5th and final printing of OUTCAST BY KIRKMAN & AZACETA #1 (Diamond Code AUG148326) will be available on 10/22. OUTCAST BY KIRKMAN & AZACETA #4 is available with Diamond Code JUL140566.